As I continue to explore the Gallery’s magnificent collection and spend time getting to know my colleagues better, I have been struck by the extraordinary talent and commitment of my coworkers. My conversations with my Gallery colleagues have inspired me to highlight some of the behind-the-scenes partnerships that have shaped our offerings this spring. Complex exhibition projects like Matthew Barney: Redoubt, opening March 1, deeply engage staff across the Gallery and draw on their creativity and expertise. Barney, B.A. 1989, created four monumental sculptures for the project from burned-out trees harvested from Idaho’s Sawtooth Mountains. Andrew Daubar, Exhibition Production Manager, and Sean Dunn, Director of Facilities, are working to ensure that the weight of the trees will be properly supported when they are installed in the galleries. In addition to the sculptures, the Redoubt project comprises a feature-length film and more than 40 objects in other media. Senior associate registrar Amy Dowe is overseeing the complicated logistics of the movement of these works in and out of the Gallery. After leaving Yale, the exhibition travels to Beijing and then London. 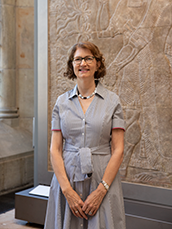 Carol Snow, Deputy Chief Conservator and the Alan J. Dworsky Senior Conservator of Objects, has studied the physical structure of the sculptures in depth and will monitor their condition for the journey. A Nation Reflected: Stories in American Glass, our second spring exhibition, opens March 29. Organized by a team of students under the direction of John Stuart Gordon, the Benjamin Attmore Hewitt Associate Curator of American Decorative Arts, the exhibition builds on Gordon's 2018 publication, American Glass: The Collections at Yale, and is the product of a fall-semester History of Art seminar. Student curators Julia Carabatsos, MC ’20, Nolan Crawford, GH ’19, Lily Dodd, SM ’21, Adelaide Goodyear, PC ’19, Mari Melin-Corcoran, GH ’20, and Jocelyn Wickersham, ES ’19, 9, examined objects firsthand to learn more about the collection, then determined the organizing themes of the exhibition. Among the wide variety of programs organized this spring by Molleen Theodore, Associate Curator of Programs, are multiple showings of the Redoubt film and the last four lectures in John Walsh’s immensely popular series Vincent van Gogh’s Turning Points. If you cannot make it to a Gallery program or want to explore the museum on your own, our new, free mobile app offers another way to engage with the collection. This audio guide lets you explore the museum and learn about our collection from curators, scholars, conservators, and students. My colleagues and I invite you to take advantage of all that the Gallery has to offer this spring.